Square Business Cards is rated 4.4 out of 5 by 24. Rated 5 out of 5 by ywang from Great value Excellent product with good pricing, fast turnaround and shipping. Definitely will use this for all future needs. Rated 5 out of 5 by US Pinay from Exact to Specifications Correct color, crisp letters and great online chat service. Rated 5 out of 5 by E. Lotus from Always a great quality I have used 48 hour print for more than 5 years as a graphic designer. They have always helped me provide my clients with professional and quick turn-around products. Rated 2 out of 5 by EP33156 from Cards measure Bigger than 3x3 I bought them thinking they would be a little bigger than the usual square business cards, but these are huge. They don’t fit in jean pockets or shirt pockets. The cards measure bigger than 3x3 with a ruler. Color is nice but the quality of the paper is that of advertising flyers. I wish I wouldn’t have ordered 500. If you want to create unforgettable business cards, square business card printing should be on top of your list. Square business cards are both memorable and versatile, and their square shape makes them perfect for square, round, and -- if you tip them to the side -- diamond logos. 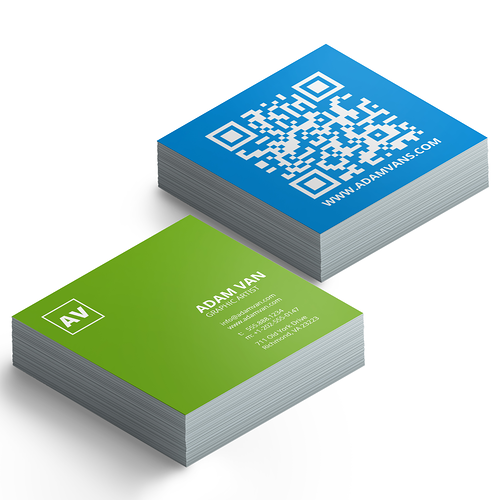 Customize your square business card with your company information on one side, and logo or photograph on the other side. Order square business cards in sizes 2” x 2”, 2.5” x 2.5”, 3” x 3”, and 3.5” x 3.5” on a selection of thick stocks in a variety of finish options, including gloss, matte, and UV. Learn how to use square business card printing effectively by reading our business card marketing tips. Download our business card templates for layout guidelines that will make your printing experience go a lot smoother. Print square business today for your most memorable cards yet.